Placing furniture in the corners of this room allows for optimal light, making the room feel bigger. Photo courtesy Andi Holliday. Andi Holliday in a home she staged. Photo by Collin Richie. With expertise in crowd-pleasing design, Stage Presence owner Andi Holliday knows how to instantly transform a house into a home. 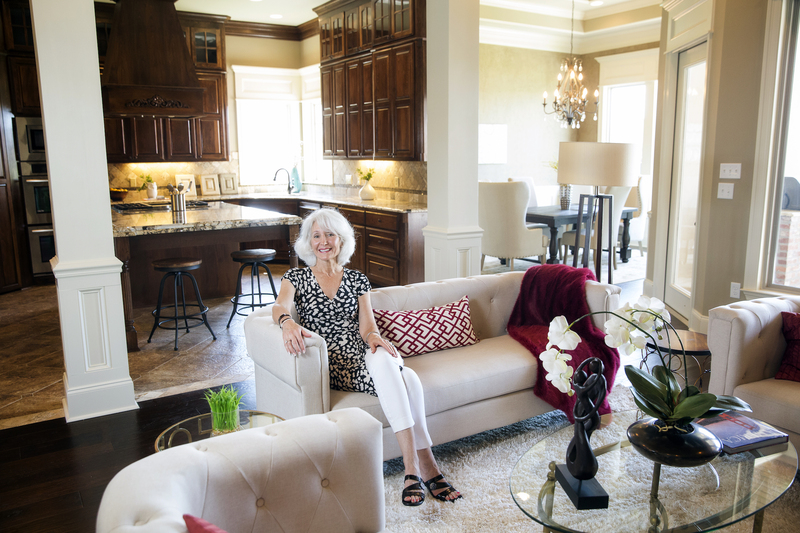 For Holliday, home staging has offered her the vantage point to understand what appeals to the widest audience possible and how that translates into the reality of a home, far beyond the installation of temporary furniture. Often, buyers will invite her back to their homes to re-create the staged looks that allowed them to see themselves in the home. Step 1: Float the furniture toward a focal point. Don’t feed into the misconception that a space will seem larger if the furniture is against the walls. Holliday notes that leaving the center of the room bare will only make the room seem smaller. They key when placing furniture, according to Holliday, is to optimize natural light by placing pieces away from doorways and windows. This will make the room seem large and roomy, even if it isn’t. Step 2: Go large and light. To create an airy look that will grow with you, choose light colors for the largest elements of a space, such as the walls and furniture. By anchoring the room in light neutrals, the space can grow through the seasons by working with multiple color palettes and enhancing the flow of natural light. Step 3: Pick your busy. For Holliday, while the fun colors and patterns that allow for the personalization of a home are absolutely essential, these aspects should be used sparingly. She suggests sticking to a specific color palette and limiting patterns to either the rug or the pillows, but not both. In doing so, the space keeps a clean look without being overwhelmed by accessories and clashing colors. To learn more about Holliday and Stage Presence, visit stagepresence4u.com, and check out this article on her work from a past issue of inRegister.